Is It Safe For Kids To See A Chiropractor? As an adult you know how important chiropractic care is to your life. Well, chiropractic is just as important for children. Some parents may wonder “What could my child have wrong, that they would need to see a chiropractor?” There are several answers to that question but the most common is the trauma of a child’s daily life. The child's spine consists of 33 vertebral segments (some of which are fused as they grow older) which can often be jammed or misaligned causing minor spinal problems known as spinal subluxations. 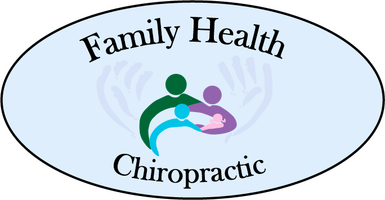 At Family Health Chiropractic we believe that most problems that occur in adults actually begin in childhood. Even the birthing process is traumatic. We want everyone to experience the effects of optimum health, including kids. We understand how scary it may be for a parent to take their child to any type of doctor. We want you to be fully informed about your child’s chiropractic care and will be happy to explain each detail and answer any questions you may have. A young spine, with few exceptions, usually develops perfectly by the end of pregnancy. It's what happens around the time of birth and in the months thereafter which can sometimes upset the normal functioning of the spine. Spinal segments can be crowded or jammed by the position of the baby in the womb or by decreased space in the womb (intrauterine constraint). The baby can also suffer similar problems during labor from the trauma of the trip through the birth canal, or from the birthing process itself. If we think about the life of a young child, we can see that they are constantly experiencing some sort of trauma on an ongoing basis. Spinal problems can occur as a result of the frequent falls suffered by young infants in the first months of life. A fall from a bed, a sudden stop in an automobile, or any significant unsupported movement of the head and neck in an infant can induce excessive movement in the spine causing vertebral subluxations. At the other end of the spine, the act of learning to walk, and the number of simple falls encountered in this way, can induce trauma to the lower spinal segments and to the large sacroiliac joints of the pelvis. Young children learning to walk also fall and hit their heads. These apparently innocent, frequently occurring events can also create spinal subluxations. Unless a child has an obvious problem, it can be difficult for parents to recognize when a child has spinal subluxations. It is not always easy for someone other than a chiropractor, highly trained in evaluating the spine, to determine if the child has a problem. There are some signs however which parents may look for which can be an indicator of a child with a spinal problem. Common indicators of spinal problems may include the child's head consistently being tilted to one side; restricted head or neck motion to one side; disturbed sleeping patterns where the child sleeps for only an hour or two at a time; feeding difficulties in the very young infant; the infant may have difficulty nursing at the breast on one particular side. The first thing your chiropractor will do is to conduct a careful and thorough evaluation of your child's spine. Many chiropractors are trained to evaluate pediatric spinal problems and will use gentle, specific skills to identify, evaluate, and adjust any involved spinal areas. What Does the Adjustment Involve? Spinal adjustments for infants and young children involve very light finger-tip adjustments to correct malfunctioning spinal structures. A light spinal adjustment, using very low pressure, is usually sufficient to restore proper spinal function to spinal joints which have become locked and are causing interference with the normal function of the nervous system. Some adjustments may make a "popping" sound when the spinal joints are moved, however this sound is not always heard when children's spines are adjusted. Children's spines are a lot more mobile than those of adults; however, the actual number of adjustments vary from child to child, depending on the issues found during the evaluation. The risk of a child suffering a permanent injury from a spinal adjustment is extremely rare. Chiropractors have been adjusting children's spines for most of the 100 years since chiropractic was first established, and has an excellent safety record. Very easily! Either fill out the "Contact Us" form below, or give us a call at 405-364-7800 and we will be happy to schedule you for the next available appointment time or whenever works best for you.